Executive members – this one is for you! Active members are the lifeblood of any organization, but it’s our executive membership that really set the tone and foundation for our member companies to become active in WICT New England. One of our chapter goals is to engage and grow our executive membership and bring even greater awareness to the national programs WICT offers. 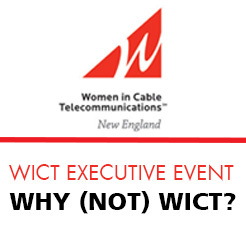 In order to maximize this opportunity and as part of the cost of the session, we’re asking each executive member to bring two people with him or her – one current WICT member and one non-member. Sponsorship opportunities to support this program are available. Please contact wictne@gmail.com to learn more!